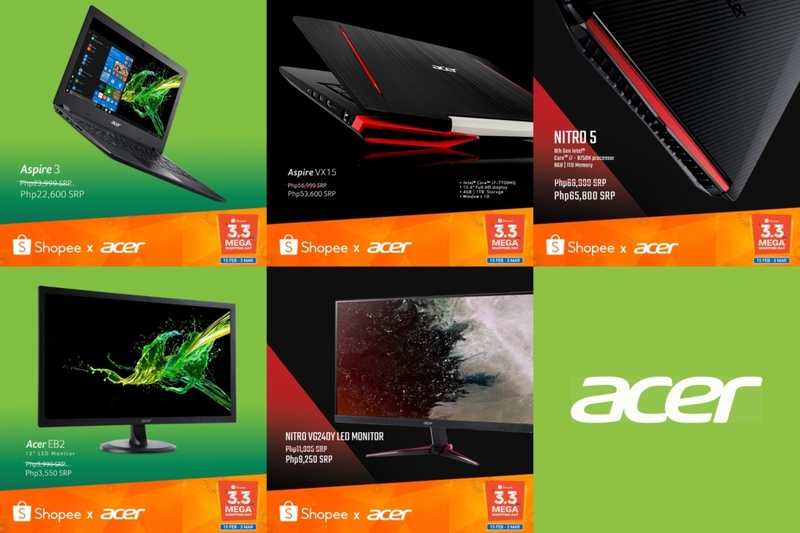 Acer has released their roster of products on sale for the Shopee 3.3 Mega Shopping Day and up to Php 3300 in savings can be had for a couple of monitors and several notebooks. Details on the sale after the jump. Manila, Philippines, February 28, 2019 – Acer just dropped their exciting deals for the highly-anticipated Shopee 3.3 Mega Shopping Day and it includes a 10% discount on Acer Nitro 5 laptop or monitor, and 11% off on Acer EB2 EB192Q 18.5” LED! The Shopee 3.3 Mega Shopping Day Sale, which started February 15, features themed days and big discounts of up to 90% off from leading brands, with flash sales that go as low as ₱33, free shipping fees for as low as ₱99 and a whopping ₱3 million worth of vouchers. Other exciting activities include upsized sessions on Shopee Quiz and Shopee Shake where users can earn and win Shopee coins. Visit Acer’s Official Store on Shopee at https://shopee.ph/acerphilippines and in other online platforms: Facebook – @AcerPH, Instagram – @acerph, Twitter – @acerphils, www.acer.com.ph.